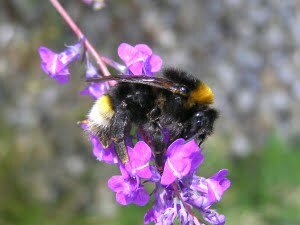 A gardener at a Dublin park has rediscovered a bumblebee species last recorded in Ireland in 1926. Eddie Hill, who is an avid bee recorder, and regularly submits bee sightings to the National Bumblebee Monitoring scheme, noticed some odd looking bees feeding on flowers at St. Enda’s Park in Rathfarnam. After studying photographs and two specimens of the bees, experts Dr. Tomás Murray and Dr. Úna Fitzpatrick from the National Biodiversity Data Centre were able to confirm that they were the Southern cuckoo bumblebee, which was last recorded in Ireland 88 years ago. “I’ve been interested in bumblebees for the past two years after learning how to identify them at a National Bumblebee Monitoring Scheme workshop. With my work, I’m in St. Enda’s most days, so when I saw these bees pollinating flowers in the park, I just knew they were different,” said Eddie. It’s a significant discovery according to ecologist Dr. Tomás Murray, who is project coordinator for the National Bumblebee Monitoring Scheme. Renowned entomologist Arthur Wilson Stelfox, working for the National Museum in Dublin, was the last person to record the speciesnear Bagenalstown, Co. Carlow in 1926. The site where the discovery was made, St. Enda’s Park, is run by the Office of Public Works, and is home to the Pádraig Pearse Museum, a visitor centre and a nature study room set in nearly 50 acres of parkland that supports a variety of flora and fauna. This discovery highlights how important green spaces in urban areas can be for wildlife, especially our beleaguered pollinators, and Eddie Hill is determined to document as many as he can. “I’ve successfully roped many of my colleagues in work into photographing insects for me, so now that I have found such a lovely rare bumblebee, we’ve all been given a boost to go out and try to record a good few more species for the Data Centre!” he said. The National Biodiversity Data Centre run annual identification workshops covering various groups of plants and animals. I’m not sure when the next pollinator / bumblebee workshop is — check out their events page here. It’s also worth checking their Irish Pollinator Initiative page, which has lots of great info on their recording scheme, downloadable identification guides, species accounts and much more.